Live entertainment, delicious Northwest cuisine and amazing views provide the perfect ingredients for a Portland Brunch to remember. Whether it's a birthday party to remember or an office party with a twist, this two hour cruise on the Willamette River is perfect for Portland natives and newcomers alike. With views of the Portland and the historic Milwaukie waterfront, this will be an unforgettable cruise. Portland Spirit public cruises boards at the Salmon Street Springs Fountain in Tom McCall Waterfront Park. The fountain is located in the park where Salmon Street meets Naito Parkway/Front Avenue. Our Champagne Brunch is our passenger favorite cruise. It is meant to be as relaxing as possible. 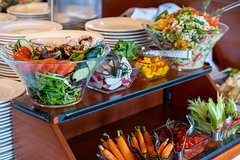 We keep the buffet open until 1:30 so that if you don't fell like eating right away you can feel free to wander the vessel. It is designed so that you can take your time and cruise the way you want. You will have a dedicated server so at any point during the cruise they will be able to help you make sure it is an amazing experience.